Provenance-based Security and Transparent Computing. I’ll now walk through my 3 big take aways from the event. DARPA’s $60 million transparent computing explicitly calls out the use of provenance to address the problem of what’s called an Advanced Persistent Threat (APTs). APTs are attacks that are long terms, look like standard business processes, and involve the attacker knowing the system well. This has led to a number of groups exploring the use of system level provenance capture techniques (e.g. SPADE and OPUS) and then integrating that from multiple distributed sources using PROV inspired data models. This was well described by David Archer is his talk as assembling multiple causal graphs from event streams. James Cheney’s talk on provenance segmentation also addressed these issues well. This reminded me some what of the work on distributed provenance capture using structured logs that the Netlogger and Pegasus teams do, however, they leverage the structure of a workflow system to help with the assembly. I particularly liked Yang Ji, Sangho Lee and Wenke Lee‘s work on using user level record and replay to track and replay provenance. This builds upon some of our work that used system level record replay as mechanism for separating provenance capture and instrumentation. But now in user space using the nifty rr tool from Mozilla. I think this thread of being able to apply provenance instrumentation after the fact on an execution trace holds a lot of promise. Overall, it’s great to see this level of attention on the use of provenance for security and in more broadly of using long term records of provenance to do analysis. Given that this was the ten year anniversary of IPAW, it was appropriate that Luc Moreau gave one of the keynotes. As really one of the drivers of the community, Luc gave a review of the development of the community and its successes.One of those outcomes was the W3C PROV standards. Overall, it was nice to see the variety of uses of PROV and the tools built around it. It’s really become the jumping off point for exploration. For example, Pete Edwards team combined PROV and a number of other ontologies including (P-Plan) to create a semantic representation of what’s going on within a professional kitchen in order to check food safety compliance. Another example is the use of PROV as a jumping off point for the investigation into the provenance model of HL7 FHIR (a new standard for electronic healthcare records interchange). As whole, I think the attendees felt that what was missing was an active central point to see what was going on with PROV and pointers to resources for implementation. The aim is to make sure that the W3c PROV wiki is up-to-date and is a better resource overall. An interesting theme was the use of provenance concepts to give a frame for other practices. For example, Susan Davidson gave a great keynote on data citation and how using a variant of provenance polynomials can help us understand how to automatically build citations for various parts of curated databases. The keynote was based off her work with James Frew and Peter Buneman that will appear in CACM (preprint). Another good example of provenance to support data citation was Nick Car’s work for Geoscience Australia. Furthermore, the notion of provenance as the substructure for complex documents appeared several times. For example, the Impacts on Human Health of Global Climate Change report from globalchange.gov uses provenance as a backbone. Both the OPUS and PoeM systems are exploring using provenance to generate high-level experiment reports. Finally, I thought David Koop‘s versioning of version trees showed how using provenance as lens can help better understand versioning of version trees themselves. (I have to give David credit for presenting a super recursive concept so well). Overall, another great event and I hope we can continue to attract new CS researchers focusing on provenance. Theoretical provenance paper recipe = extend provenance polynomials to deal with new operators. Prove nice result. e.g. now for Linear Algebra. Prefixes! R-PROV, P-PROV, D-PROV, FS-PROV, SC-PROV, — let me know if I missed any.. Thanks to Adriane for hosting! I still think hooking up Abstract Meaning Representation to linked data semantics is something worth trying out. Silicon Beach is like a thing. Overhead in Venice, literally, “Tech dude: We need to iterate and test our mvp. Product dude: Steve Jobs didn’t ask what the marked wanted. We need vision!”. JSON-LD + PROV + Elastic Search + lots of other stuff is awesome. I DIG it. Looking forward to hearing more at ISWC. UCSB has a sweet campus…. A nice ontology for software metadata: OntoSoft. AirBnB is great but this is the first trip where I encountered negative responses from neighbors / neighborhood. I’d love to hear your thoughts on this line of thinking. The aim of the workshop was to discuss how knowledge organization systems and classification systems change. By knowledge organization systems, we mean things like the Universal Decimal Classification system or the Wikipedia Category Structure. My interest here is the interplay between the change in data and the change in the organization system used for that data. For example, I may use a certain vocabulary or ontology to describe a dataset (i.e. the columns), how does that impact data analysis procedures when that organization’s meaning changes. Many of our visualizations decisions and analysis are based on how we categorize (whether mechanical or automatically) data according to such organizational structures. Albert Meroño-Peñuela gave an excellent example of that with his work on dutch historical census data. Furthermore, the organization system used may impact the ability to repurpose and combine data. Interestingly, even though we’ve seen highly automated approaches emerge for search and other information analysis tasks Knowledge Organization Systems (KOSs) still often provide extremely useful information. For example, we’ve see how scheme.org and wikipedia structure have been central to the emergence of knowledge graphs. Likewise, extremely adaptable organization systems such as hashtags have been foundational for other services. At the workshop, I particularly enjoyed Joesph Tennis keynote on the diversity and stability of KOSs. He’s work on ontogeny is starting to measure that change. He demonstrated this by looking at the Dewey Decimal System but others have shown that the change is apparent in other KOSs (1, 2, 3, 4). Understanding this change could help in constructing better and more applicable organization systems. 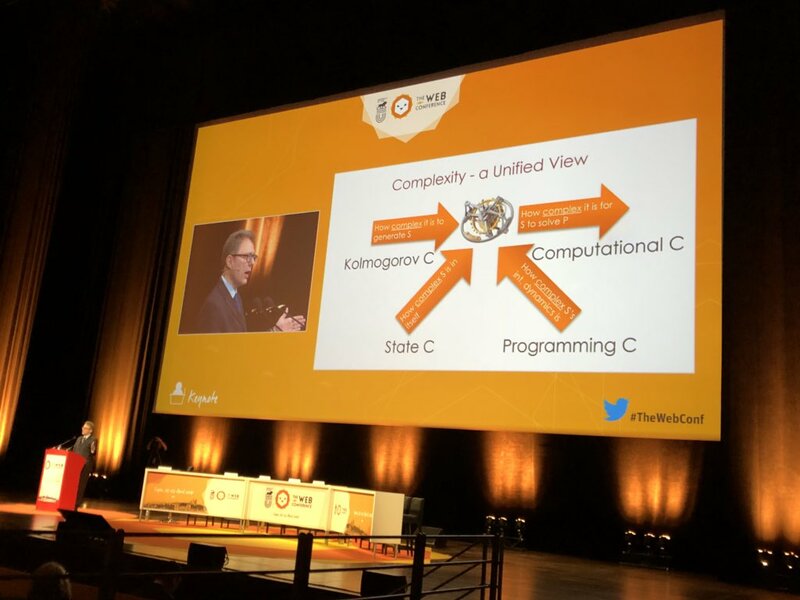 From both Joseph’s talk as well as the talk Richard Smiraglia (one of the leaders in the Knowledge Organization), it’s clear that as with many other sciences our ability to understand information systems can now become much more deeply empirical. Because the objects of study (e.g. vocabularies, ontologies, taxonomies, dictionaries) are available on the Web in digital form we can now analyze them. This is the promise of Web Observatories. Indeed, that was an interesting outcome of the workshop was that the construction of KOSs observatory was not that far fetched and could be done using aggregators such as Linked Open Vocabularies and Taxonomy Warehouse. I’ll be interested to see if this gets built. The demo of concept networks from bibliography data by OCLC looked pretty cool. I’m looking forward to reading their CHI poster paper. Welcome to a massive multimedia extravaganza trip report from Provenance Week held earlier this month June 9 -13. Given that I’m deeply involved in the community, it’s going to be hard to summarize everything of interest because…well…everything was of interest, it also means I had a lot of stuff going on. So what was I doing there? Together with Luc Moreau and Trung Dong Huynh, I kicked off the week with a tutorial on the W3C PROV provenance model. The tutorial was based on my recent book with Luc. From my count, we had ~30 participants for the tutorial. We’ve given tutorials in the past on PROV but we made a number of updates as PROV is becoming more mature. First, as the audience had a more diverse technical background we came from a conceptual model (UML) point of view instead of starting with a Semantic Web perspective. Furthermore, we presented both tools and recipes for using PROV. The number of tools we now have out for PROV is growing – ranging from conversion of PROV from various version control systems to neuroimaging workflow pipelines that support PROV. I think the hit of the show was Dong’s demonstration of interacting with PROV using his Prov python module (pypi) and Southampton’s Prov Store. I had two papers in the main track of the International Provenance and Annotation Workshop (IPAW) as well as a demo and a poster. Manolis Stamatogiannakis presented his work with me and Herbert Bos – Looking Inside the Black-Box: Capturing Data Provenance using Dynamic Instrumentation . In this work, we looked at applying dynamic binary taint tracking to capture high-fidelity provenance on desktop systems. This work solves what’s known as the n-by-m problem in provenance systems. Essentially, it allows us to see how data flows within an application without having to instrument that application up-front. This lets us know exactly which output of a program is connected to which inputs. The work was well received and we had a bunch of different questions both around speed of the approach and whether we can track high-level application semantics. A demo video is below and you can find all the source code on github. We also presented our work on converting PROV graphs to IPython notebooks for creating scientific documentation (Generating Scientific Documentation for Computational Experiments Using Provenance). Here we looked at how to try and create documentation from provenance that is gathered in a distributed setting and put that together in easy to use fashion. This work was part of a larger kind of discussion at the event on the connection between provenance gathered in these popular notebook environments and that gathered on more heterogeneous systems. Source code again on github. I presented a poster on our (with Marcin Wylot and Philippe Cudré-Mauroux) recent work on instrumenting a triple store (i.e. graph database) with provenance. We use a long standing technique provenance polynomials from the database community but applied for large scale RDF graphs. It was good to be able to present this to those from database community that we’re at the conference. I got some good feedback, in particular, on some efficiencies we might implement. I also demoed (see above) the really awesome work by Rinke Hoekstra on his PROV-O-Viz provenance visualization service. (Paper, Code) . This was a real hit with a number of people wanting to integrate this with their provenance tools. At the end of the week, we co-organized with the ProvBench folks an afternoon about challenge tasks and benchmark datasets. In particular, we looked at the challenge of provenance reconstruction – how do you recreate provenance from data when you didn’t track it in the first place. Together with Tom De Nies we produced a number of datasets for use with this task. It was pretty cool to see that Hazeline Asuncion used these data sets in one of her classes where her students used a wide variety of off the shelf methods. From the performance scores, precision was ok but very dataset dependent and relies on a lot on knowledge of the domain. We’ll be working with Hazeline to look at defining different aspects this problem going forward. Provenance reconstruction is just one task where we need datasets. ProvBench is focused on gathering those datasets and also defining new challenge tasks to go with them. Checkout this github for a number of datasets. The PROV standard is also making it easier to consume benchmark datasets because you don’t need to write a new parser to get a hold of the data. The dataset I most liked was the Provenance Capture Disparities dataset from the Mitre crew (paper). They provide a gold standard provenance dataset capturing everything that goes on in a desktop environment, plus, two different provenance traces from different kinds of capture systems. This is great for testing both provenance reconstruction but also looking how to merge independent capture sources to achieve a full picture of provenance. There is also a nice tool to covert Wikipedia edit histories to PROV. I think I picked out four large themes from provenance week. One issue with provenance systems is getting people to install provenance collection systems in the first place let alone installing new modified provenance-aware applications. A number of papers reported on techniques aimed to make it easier to capture more transparent. A couple of approaches tackled this for the programming languages. One system focused on R (RDataTracker) and the other python (noWorkflow). I particularly enjoyed the noWorkflow python system as they provided not only transparent capture for provenance systems but a number of utilities for working with the captured provenance. Including a diff tool and a conversion from provenance to Prolog rules (I hope Jan reads this). The prolog conversion includes rules that allow for provenance specific queries to be formulated. (On Github). noWorkflow is similar to Rinke’s PROV-O-Matic tool for tracking provenance in python (see video below). I hope we can look into sharing work on a really good python provenance solution. An interesting discussion point that arose from this work was – how much we should expose provenance to the user? Indeed, the team that did RDataTracker specifically inserted simple on/off statements in their system so the scientific user could control the capture process in their R scripts. Tracking provenance by instrumenting the operating system level has long been an approach to provenance capture. Here, we saw a couple of techniques that tried to reduce that tracking to simply launching a system background process in user space while improving the fidelity of provenance. This was the approach of our system Data Tracker and Cambridge’s OPUS (specific challenges in dealing with interposition on the std lib were discussed). Ashish Gehani was nice enough to work with me to get his SPADE system setup on my mac. It was pretty much just a checkout, build, and run to start capturing reasonable provenance right away – cool. Databases have consistently been a central place for provenance research. I was impressed Boris Glavic’s vision (paper) of a completely transparent way to report provenance for database systems by leveraging two common database functions – time travel and an audit log. Essentially, through the use of query rewriting and query replay he’s able to capture/report provenance for database query results. Talking to Boris, they have a lot it implemented already in collaboration with Oracle. Based on prior history (PostgresSQL with provenance), I bet it will happen shortly. What’s interesting is that his approach requires no modification of the database and instead sits as middleware above the database. Finally, in the discussion session after the Tapp practice session, I asked the presenters who represented the range of these systems to ballpark what kind of overhead they saw for capturing provenance. The conclusion was that we could get between 1% – 15% overhead. In particular, for deterministic replay style systems you can really press down the overhead at capture time. I think Susan Davidson said it best in her presentation on provenance for crowdsourcing – we are at the OLAP stage of provenance. How do we make it easy to combine, recombine, summarize, and work with provenance. What kind of operators, systems, and algorithms do we need? Two interesting applications came to the fore for this kind of need – crowdsourcing and security. Susan’s talk exemplified this but at the Provenance Analytics event there were several other examples (Huynh et al., Dragon et al). The final theme I saw was how to connect provenance across sources. One could also call this provenance integration. Both Chapman and the Mitre crew with their Provenance Plus tracking system and Ashish with his SPADE system are experiencing this problem of provenance coming from multiple different sources and needing to integrate these sources to get a complete picture of provenance both within a system and spanning multiple systems. I don’t think we have a solution yet but they both (ashish, chapman) articulated the problem well and have some good initial results. This is not just a systems problem, it’s fundamental that provenance extends across systems. Two of the cool use cases I saw exemplified the need to track provenance across multiple sources. The Kiel Center for Marine Science (GEOMAR) has developed a provenance system to track their data throughout their entire organization stemming from data collected on their boats all the way through a data publication. Yes you read that right, provenance gathered on awesome boats! This invokes digital pens, workflow systems and data management systems. The other was the the recently released US National Climate Change Assessment. The findings of that report stem from 13 different institutions within the US Government. The data backing those findings is represented in a structured fashion including the use of PROV. Curt Tilmes presented more about this amazing use case at Provenance Analytics. In many ways, the W3C PROV standard was created to help solve these issues. I think it does help but having a common representation is just the start. I didn’t mention it but I was heartened to see that community has taken to using PROV as a mechanism for interchanging data and for having discussions. My feeling is that if you can talk provenance polynomials and PROV graphs, you can speak with pretty much anybody in the provenance community no matter which “home” they have – whether systems, databases, scientific workflows, or the semantic web. Indeed, this is one of the great things about provenance week, is that one was able to see diverse perspectives on this cross cutting concern of provenance. Lastly, there seemed to many good answers at provenance week but more importantly lots of good questions. Now, I think as a community we should really expose more of the problems we’ve found to a wider audience. DLR did a fantastic job of organizing. Great job Carina, Laura and Andreas! I’ve never had happy birthday sung to me at by 60 people at a conference dinner – surprisingly in tune – Kölsch is pretty effective. Thanks everyone! Stefan Woltran’s keynote on argumentation theory was pretty cool. Really stepped up to the plate to give a theory keynote the night after the conference dinner. Speaking of theory, I still need to get my head around Bertram’s work on Provenance Games. It looks like a neat way to think about the semantics of provenance. Check out Daniel’s trip report on provenance week. I think this is long enough…..